A common abbreviation for Front Free EndPaper. Generally, it is the first page of a book and is part of a single sheet that also spans across the inside of the front board (called the front pastedown) via a fold along the gutter with the purpose of connecting the boards to the stitched textblock. As a result of this purpose, the paper quality of the ffep is generally of a heavier weight than those used for the pages of the book, and is often decorative. 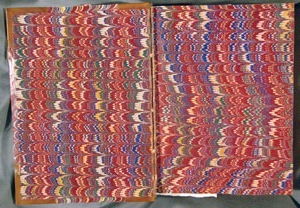 The front free endpaper (or ffep) is also a common place to encounter signatures or inscriptions. Also, the gutter between the ffep and front pastedown is a very common place to encounter damage to a book, notably a cracked binding.